I've been dehydrating food for years, so I know a thing or two about them. In this article, I'm going to share with you what I think are the four best dehydrators for home use. This is based on personal experience and also on information gleaned from hours and hours of research. You'll be able to compare the features, the pros and cons, and prices of the four models. I've also included information about dehydrators in general, how to use them, and what to consider before buying one. I hope this will help you in your search for the dehydrator that's right for you. I don't want to keep you in suspense, so I'm going to tell you up front that my Number One Pick is the Excalibur 3926TB. You can get the details below. Or if you're in a hurry, you can click here to go to Amazon to check the current price and read the reviews. What are the benefits of dehydrating food? At what temperature should I dry the food? Why is a dehydrator better than using the oven? How do you use dehydrated foods? How should I store my dehydrated food? What's the difference between dehydrated and freeze dried food? Does dehydrating affect the nutritional value of food? What are dehydrators good for besides drying food? Verdict: What's the Best Food Dehydrator? In this table, you'll find my top four dehydrator picks along with some basic comparison information. Excalibur dehydrators are pretty much considered the Cadillac of dehydrators for home use. This is the brand that I have, myself, although I don't have the exact same model as the one in this review. Mine is just like this, except it doesn't have an automatic timer. If I had it to do over again, the 3926TB would be my choice. By the way, the "B" in the model number means black. The white version is model 3926TW. Something I like a lot about this dehydrator is the simplicity of the controls. You have two dials on the top of the unit. One is to set the temperature, and the other is to set the timer. There is no power button. The timer itself serves as the on/off switch. You just set the time for as long as you want, and it starts up the motor. When the time is up, it shuts off automatically. The temperature range doesn't go quite as low as the Presto and Nesco do, but I haven't found that to be a problem. The difference between 95°F and 105°F is negligible when you're drying things like herbs. You can just decrease the drying time a little bit if your recipe calls for a temperature lower than 105°F. It's obvious that the Excalibur 3926TB is a big dehydrator. It has a total drying area of 15 square feet. That's more than twice as big as the two stackable models! Even if you add extra trays to the others, they're not going to have as much area as the Excalibur. So if being able to dehydrate large quantities of food is a high priority for you, this one is the clear winner. Keep in mind, though, that it takes up a lot of space. It's not going to fit well on most countertops, so you'll need to think about where you can put it. It's 12.5" high by 17" wide by 19" deep. That depth is from front to back. The fan is in the back, so you'll need a couple of inches of space for air flow. And you'll be loading the trays from the front, so you need plenty of space for maneuvering. One major difference between the Excalibur and the stackable models is that the fan and heater are located in the back of the unit. A large 7-inch fan draws in air from the back and distributes the heated air evenly throughout the interior. Because of this design, you don't need to shift trays up and down to achieve even drying. However, with certain foods, you may find that one side dries faster than the other. If that's the case, you can rotate the trays 180° halfway through the drying process. Another advantage of the design is that it makes cleanup a snap. You don't have to worry about juices dripping down and making a big mess in the fan and electronics since they're on the back of the unit. There's nothing in the bottom, so it's easy enough to just wipe it out. 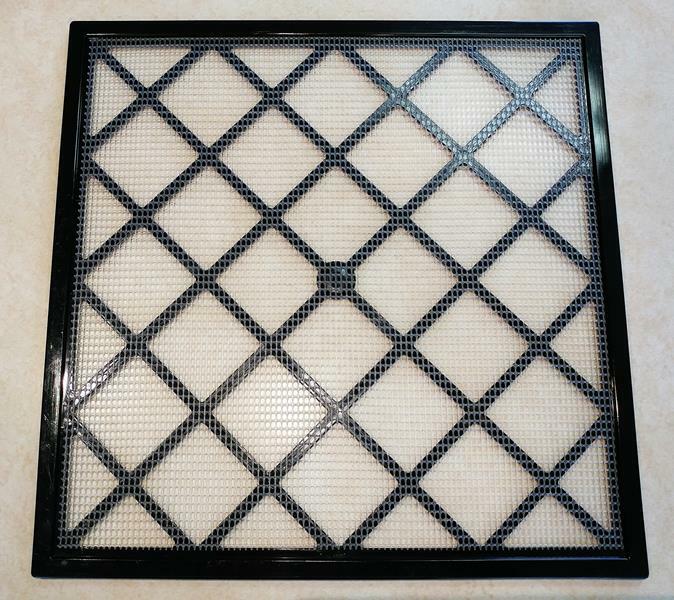 The drying trays come with flexible plastic mesh inserts. Because they're flexible, you can pick them up and bend them a little to easily peel off sticky pieces of food like fruit. And, when you're done drying non-sticky foods like nuts or herbs, you don't have to pick up the individual pieces. Just pick up the whole sheet, bend it almost in half, and funnel the pieces into your jars or food storage bags. Unfortunately, you don't get any solid drying sheets with the Excalibur. So if you want to make fruit leather, you have to buy them separately. The good thing is they're not very expensive. You can check the price and availability of a pack of 9 non-stick sheets at Amazon by clicking here. By the way, the drying trays are dishwasher safe, but the mesh inserts and solid drying sheets are not. So, what's the biggest negative about the Excalibur 3926TB? It's the loud fan. Yes, it is loud, but so are most dehydrators. It sounds kind of like a microwave. If it bothers you, put it in a room where you can close the door. Or let it run overnight or while you're out for the day. I'll end by pointing out that the Excalibur comes with a 10 year warranty. That's pretty much unheard of in the world of appliances. Sure, sometimes you can purchase a 10-year extended warranty, but this is the standard warranty that you get when you buy it. I think that speaks volumes about the quality of Excalibur products, and it's a big reason why this dehydrator is my Number One Pick. For even more information about the Excalibur 3926TB, please see my detailed review, Excalibur 3926TB Food Dehydrator: Why So Popular? The Nesco/American Harvest Snackmaster Pro is one of the least expensive dehydrators, and it's a top seller. This is the one I would choose if I didn't have the space or the budget for the Excalibur. It's also the dehydrator that my daughter uses, and she's happy with it. This is a no-frills basic machine, but don't let that fool you. It's a little workhorse! The patented Converga-Flow system is designed to dry foods quickly and evenly. It works by forcing air down through the exterior walls of the unit and then across each individual tray. That means that each tray gets the same amount of air flow, unlike units that force air up from the bottom through all the trays. Another advantage of this design is that you don't have to rotate the trays because the air flow is even throughout. And, because the fan is on the top instead of the bottom, you don't have to worry about juices dripping down and making a mess in the electronics. This is especially important when you're making jerky. You get about 5 square feet of drying space with the trays that come with the Snackmaster. That's enough room to fit about 3 pounds of sliced beef for jerky. Need more space? Just add more trays to increase that space up to 12 square feet. You can check the current price on Nesco accessories at Amazon by clicking here. 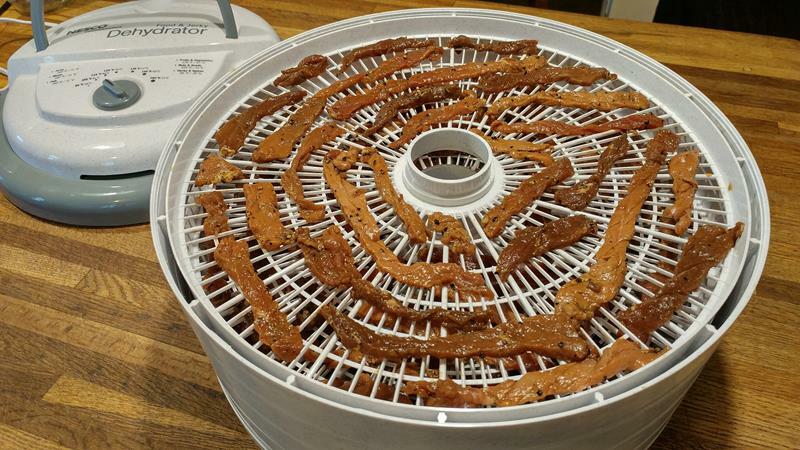 I was recently visiting my daughter, and I decided to give her Nesco dehydrator a whirl and make a batch of jerky. Making beef jerky with the Nesco Snackmaster Pro - before dehydrating. I was impressed by how quickly and evenly it dried. After only four hours of dehydrating, it was completely done. And, I didn't have to rotate the trays at all. 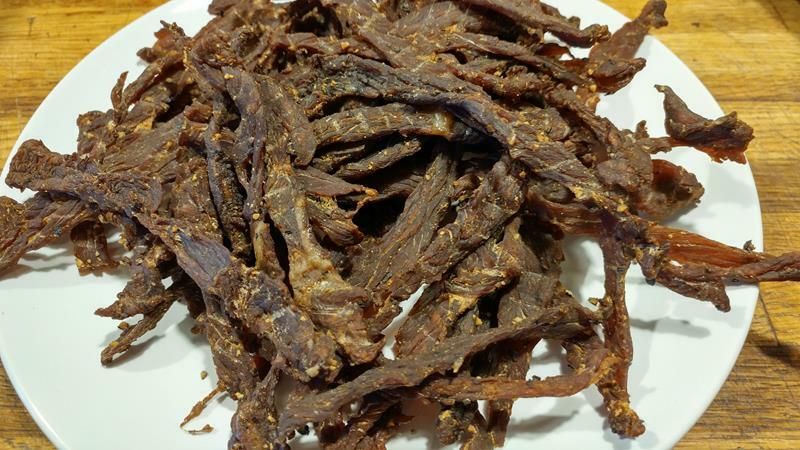 Beef jerky made with Nesco Snackmaster Pro. There's no fancy digital display on this dehydrator. You just get a dial on top to set the temperature. And it doesn't have a timer, either. So you either have to remember to turn it off yourself, or plug it into one of those vacation light timers. The dehydrator I use doesn't have a timer, and I get along just fine without one. What's the biggest complaint that people have about the Nesco Snackmaster? It's the fact that it doesn't have an on/off switch. You have to plug it in to start it and unplug it to stop it. Why they didn't design it with a switch is a mystery to me, but maybe someday they'll add one if enough people complain about it. This can be a pain in the neck if the outlet you want to use is in an inconvenient location. You could remedy this by plugging it into an outlet strip that has an on/off switch. Are the drying trays dishwasher safe? The trays and base can be cleaned in the dishwasher, but only if you put them in the top rack and remove them before the drying cycle. They don't stand up well to heat. Depending on the design of your dishwasher, you might not have any choice but to hand wash them. This dehydrator comes with a one year warranty. Nesco will repair or replace any defective units for free with proof of purchase. You might come across a Nesco Model FD-75PR dehydrator that looks exactly like the FD-75A. That's because it is the same dehydrator. It's just in different packaging. For more information, please see my detailed review of the Nesco Snackmaster Pro. 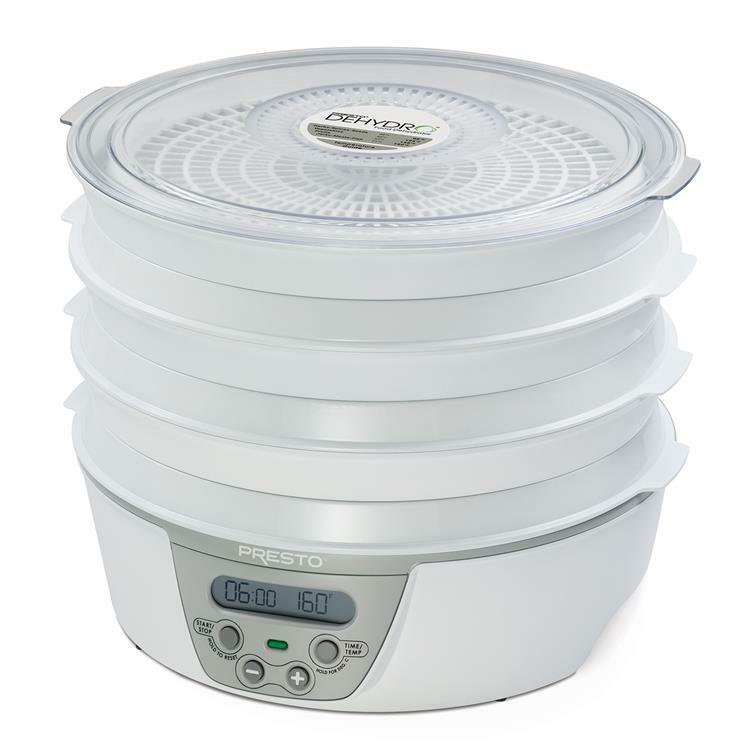 The Presto Dehydro is also a best selling dehydrator. It's in the same low price range as the Nesco. With the six trays that come with the Dehydro, you get about 6 square feet of drying space. To help you visualize, that translates into about 6 pounds of strawberries, 5 or 6 mangoes, or 2 bunches of kale. If you find that's not enough space, you can add extra drying trays, up to a total of 12. Extra trays come in sets of 2, and you can check availability at Amazon. Of the four models, this one has the widest temperature range and the lowest temperature setting. That's going to give you maximum flexibility in what you can dry with it. One of the best features of this dehydrator is the digital control panel that allows you to customize the settings exactly how you want them. Plus the timer lets you run overnight while you're sleeping, or during the day while you're at work. It shuts off automatically, so no need to worry. This unit takes up more counter space than the Nesco one does, and that also makes it a challenge to store. But the trays nest inside each other, and that reduces the vertical storage space by 43%. And, the power cord stores in the base, so that also helps with the storage issue. The manufacturer says that the food dries out evenly, and you don't need to rotate the trays. But sometimes, with certain foods, you will find that the top layer takes longer to dehydrate. That's because the heating element and fan are on the bottom of the unit. So you may find that you will need to rotate the trays sometimes. Not a deal breaker, in my opinion, but something you should be aware of if you're considering this model. Also, you may have to deal with juices dripping down through the trays and getting on the fan. That makes it a bit more difficult to clean than the other brands. What's the biggest complaint that people have about the Presto Dehydro? It's the loud noise it makes. But that's common to most dehydrators, and you'll be hard pressed to find one that doesn't make noise. This one just seems to be louder than others. As far as warranty goes, Presto offers a one year limited warranty. If you have any problems with it in the first year, they will repair or replace it. See my detailed review of the Presto Dehydro 06301 for more information. New to my top picks this year is the Gourmia GFD1950. This is a box and shelf type of dehydrator similar to the Excalibur 3926TB, but it sells at a lower price point. Gourmia might not be a familiar name to you. The company was founded in 2016 but has made a big impact already on the small appliance scene. It's based in Brooklyn, New York, and its products are manufactured in China. Click on the image to see the current price at Amazon. The Gourmia looks and acts a lot like the Excalibur, but there are some differences you'll want to know about if you're thinking about buying one. First is the temperature range. The lowest temperature is 95°F and the highest is 158°F. So it goes lower than Excalibur, but not as high. That's great if you want a lower temperature. It's not so great if you're planning to use it to make jerky. Because the meat needs to be heated to 160°F to avoid the growth of bacteria in jerky. That's according to the USDA. That's why (I'm assuming) in the recipe book you get with the GFD1950 it tells you to heat the meat at 250°F in the oven for ten minutes after you're done dehydrating it. The other three dehydrators go up to at least 160°F. Presto and Excalibur go all the way up to 165°F. It's a shame that Gourmia didn't make theirs able to go up just two degrees higher. Maybe they'll change that in future iterations. Okay, what else is different? The front cover is clear plastic. That's nice if you want to be able to keep an eye on the food without opening the door and letting out the warm air. Like the Presto Dehydro, this dehydrator has a digital thermostat and timer. You can set the timer for up to 19.5 hours in 30 minute increments. When the time is up, it shuts off automatically. You get 9 drying trays - same as Excalibur - but they are smaller, so the total drying area is about 9 square feet instead of 15 square feet. The trays are clear hard plastic, and they don't come with mesh inserts like the Excalibur does. But they do include one "protective food sheet" with the unit that you can use for drying small pieces of food. Unfortunately, you can't buy extra of those sheets, so you can only do one tray at a time. The alternative would be to buy extra Excalibur mesh inserts and cut them down to fit. It also does not include a fruit leather sheet, nor does Gourmia make them. But, again, you could buy generic sheets and cut them to size. There's also a drip tray included which helps to make cleanup easier. And speaking of cleanup - the manufacturer says that the trays and protective food sheet are not dishwasher safe. Despite some of these shortcomings, this is a decent dehydrator. It would be a good choice for someone who wants this style of dehydrator at an affordable price. Gourmia offers a one year warranty on this product. Total Drying Space - How much food will you want to dehydrate at one time? If you're going to be doing a lot, you'll need a larger drying area. Expandability - Do you want to start small and have the option to increase the drying area later? If so, you'll want to choose one of the stackable dehydrators. Size of Unit - Dehydrators come in different sizes and shapes. Do you have enough counter or table space for the model you're considering? What about storage space when you're not using it? Temperature Range - Think about what kinds of foods you will be dehydrating, and make sure that the unit you choose goes low enough and/or high enough. If you're making jerky, the temperature needs to be at least 145° to 155°F. Design - The box and shelf type dehydrators tend to do a better job of drying evenly than the stackable ones. But they also tend to be more expensive. Extras - Do you want to have a timer? Digital display? Interior light? Sometimes these bells and whistles can increase the price. Consider what's essential to you that will fit in your budget. Warranty - Look for a good warranty and for a company with a good customer service reputation, especially if you're choosing one of the more expensive models. A food dehydrator is an appliance that preserves food by taking the moisture out of it. Drying inhibits the growth of bacteria in food, so it dramatically reduces the rate of decay. Allows you to make healthy and delicious snacks like dried apples, fruit leather, kale chips, and jerky. Preserves food without canning or freezing. Prevents waste of excess garden produce. Dehydrators reduce the water content of foods using heat and the flow of air. The devices have some sort of heat source and a fan to circulate the air. The type and quality of the dehydrator. The humidity level of the air where the dehydrator is situated. The type of food and the amount of water in it. The size and shape of the pieces of food. Different foods should be dried at different temperatures. For example, the best temperature for herbs is between 90° and 110°F, but meat for jerky should be dried at about 160° to 165°F. Most dehydrators come with a user's guide that gives you the recommended temperatures for various foods. You can also find information online, or you could buy a food dehydration reference book. Controlling the air temperature and air flow are crucial to successful dehydration. A dehydrator has a more precise temperature control than an oven. Plus the optimal temperature range for dehydrating is somewhere between 90° and 165°F. Most ovens can't go that low. Also, ovens don't have a way to circulate the air. The food can't dry evenly without the proper air flow. Fruits like bananas, apples, mangos, strawberries, peaches and grapes. Vegetables like onions, peppers, mushrooms, squash, tomatoes, beets, sweet potatoes, and kale. Pureed juices to make fruit leather. Eggs (not in the shell, of course - scramble and dehydrate raw eggs to make egg powder). For even more ideas, see my post, Easy Dehydrator Recipes That Anyone Can Make. You can eat them as is, or reconstitute them with water to use in cooking. If you're making soup or other dishes with a lot of moisture, you can just toss the dried foods straight in. You can use any kind of airtight container. I like to use glass jars. It's best to keep them in a cool dark place. Putting a small food grade oxygen absorber in the container will help make the food last longer. If you have a vacuum sealer, that's a great option, too, because you can get all the air out. Plus the bags take up less storage space. When properly stored, dehydrated foods can keep for several years. Freeze drying removes about 98-99% of the moisture in food, while dehydration removes about 90-95%. So freeze-dried food has a much longer shelf life - like 25 to 30 years! It is possible to freeze dry foods at home, but the machines are quite expensive and out of most people's price range. That's why I purchase some freeze-dried foods for long term emergency food storage, but dehydrate foods that I will use in the next year or two. Not really. Most vitamins, minerals, fiber, carbohydrates, and calories remain intact. Vitamin C is more sensitive to exposure to air and heat than other nutrients, though. Compared to the extreme temperatures used for canning and freezing, dehydration has a minimal effect on the nutritional value. You can do more than just dry food in a dehydrator. But that depends a lot on the design of the appliance. Box and shelf type dehydrators like the Excalibur are the most versatile because you can remove all the shelves and have a large empty space if you need it. Drying bread for crumbs and stuffing. Drying sprouted grains for making flour. Drying Papier-mâché or other crafts that require drying. Drying garden seeds for saving. Cut pieces of food in uniform sizes for even drying. A mandolin slicer or food processor can be a big help here. Most dehydrators' fans are loud. If the noise bothers you, try running it at night. Or put it in a room where you can shut the door. Be aware that some foods like mushrooms and onions don't have a pleasant aroma while they're drying. This is another reason you might want to run the dehydrator in a out of the way place. If the air isn't too humid, you could put it in the garage or a enclosed porch. Make sure that the food is completely dry before storing it. Allow it to cool, then test it by trying to break it. If it bends rather than snaps, it's not done. Mix lemon juice and water in a small spray bottle, and give fruits a spritz before drying. This will help keep them from turning brown. Spraying the trays with a light coat of cooking oil can help prevent sticking. When making jerky, choose lean cuts of meat to prevent fat from turning rancid. This should go without saying, but read the user's manual that comes with your dehydrator before using it for the first time. As I told you back at the beginning of this article, my Number One Pick is the Excalibur 3926TB food dehydrator. It's the best because it has a great design that dries food efficiently and evenly, and it has a large capacity. If I'm going to take the time to dehydrate food, I want to get as much done at one time as possible. The drying shelves that slide in and out from the front are much more convenient than the stackable types like the Nesco and Presto models. I love the simplicity and accuracy of the controls, too. And having that timer with the automatic shutoff is a big plus. Just set it and forget it. Finally, it's the overall quality and integrity of Excalibur products, backed up by a 10-year warranty. And really, you'll probably never need that warranty, but it's reassuring to have it. I've had my Excalibur for more than six years, and I've never had a problem with it. If this sounds like the dehydrator you're looking for, you can get one for yourself today. Click here to go to Amazon and see the current price of the Excalibur 3926TB, as well as any available discounts.